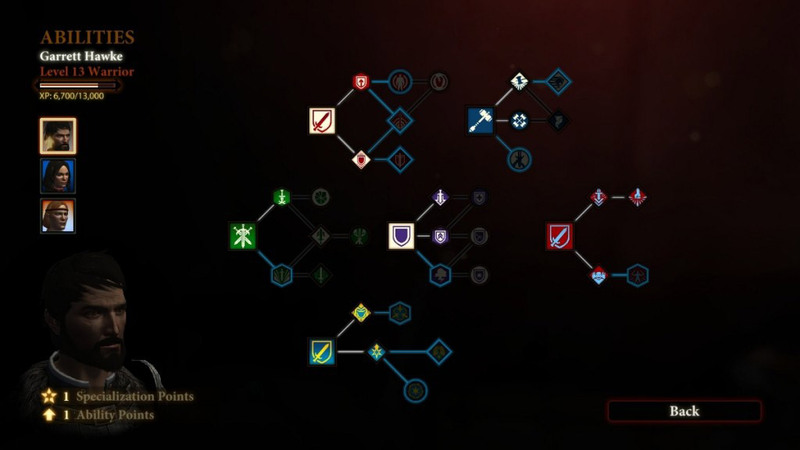 In honor of Dragon Age 2 demo dropping today, we present screenshots of the warrior's skill trees for your viewing pleasure. I just realized that DA2 is coming out a scant two weeks away (March 8th) and I got officially excited. While the first game didn't exactly bring a tear to my eye, I certainly enjoyed the tactical RPG group dynamic and the story and voice-acting were all top-notch. Everything that I've heard from Susan Arendt's trip to BioWare last month, aside from making me insanely jealous, has increased my anticipation for the game. 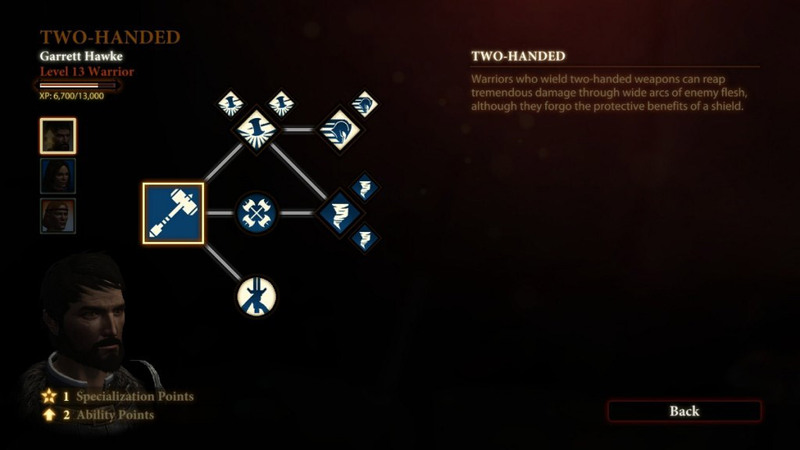 Now I have a set of images of the warrior class's skills to ponder over. Where will I invest in my version of Garrett Hawke? Looking closely, the system is similar to Origins with some very big differences. According to Susan Arendt, you are not stuck to the linear skill progression and can instead pick and choose where you want to invest two different resources. The good part is that you are not locked into anything and can get to the the skills you want through different paths. 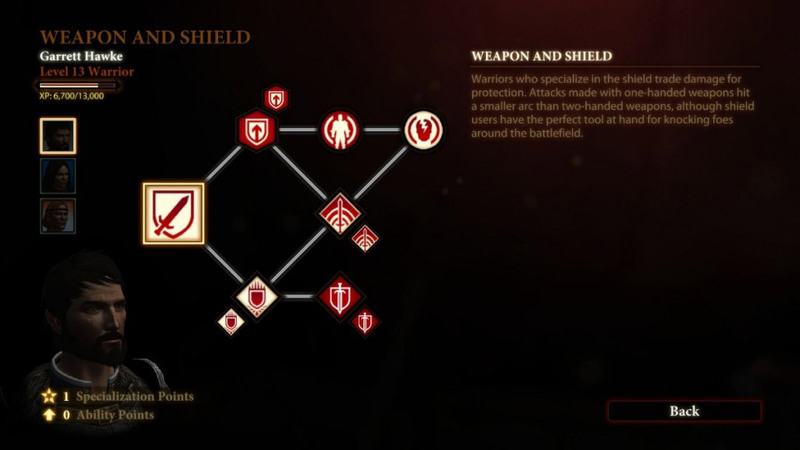 The big icons represent where you can spend Specialization Points, and they are indicative of broad weapon styles such sword and board or two-handed weapons. Once you buy those, you are free to choose where you want your Skill Points to go to unlock either passive or activated abilities. 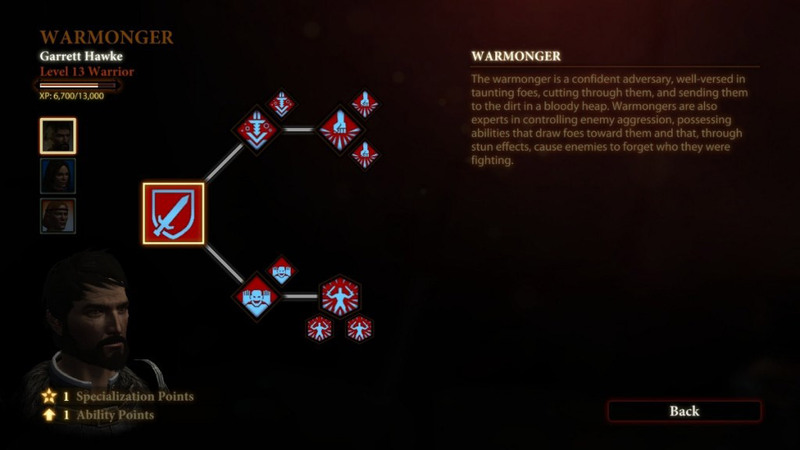 The specializations listed here for the warrior are Two-handed, Weapon and Shield, Vanguard, Warmonger, with two others not shown in detail. The individual skills are tough to decipher, but I'm sure that you guys can hazard a few guesses based on the evocative icons. 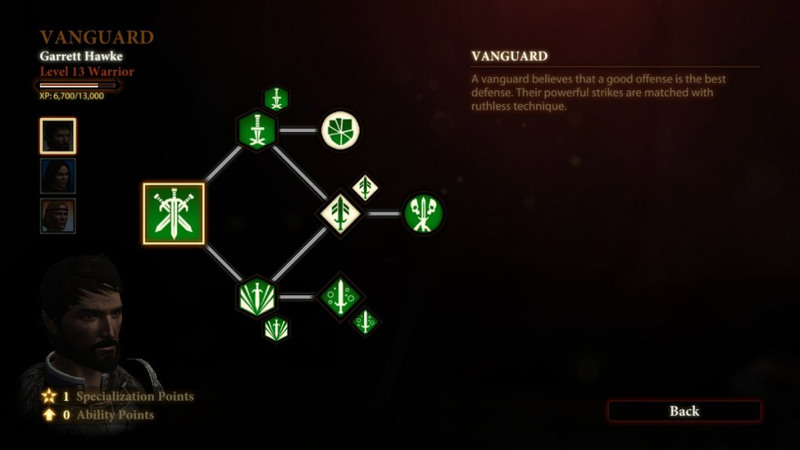 I'm pretty sure that the icon with the guy holding his hands up to his ears in the Vanguard tree means that he is a tender and caring listener, for example.